Thanksgiving has come and gone and I had the opportunity prepare the offal of the bird all by my lonesome. The results were, dare I say, spectacular. After braising the gizzard, kidneys, heart, and liver at Thanksgiving dinner in a wonderful spice concoction of tandoori powder, garlic salt, black pepper, and the offal’s natural juices, I am prepared to say that offal is wonderful. Fried-brain sandwiches are a specialty in the Ohio River Valley. Really? Perhaps it is time for a road trip. Both my wife & I areboth chefs; therefore offal is a big deal in my family & helps us to feed our 3 kids on a budget. if you dig that stuff you might get a kick out of this. I made it last night & it fed the 5 of us and there is still half left and all for well under 20 bucks. That is incredible. 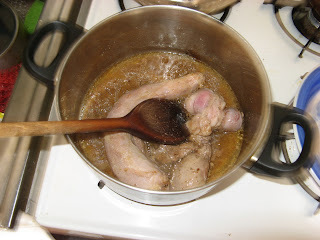 I actually have really grown to like offal, actually so that little experiment was successful. That recipe you shared looks wonderful and it is definitely something I will try. I am going to follow your blog to get some more recipes for sure. Thanks! Thank you so much; I’m rather fond of your site as well. Here are a couple more recipies you might like though admittedly I have over 100 on my site amongst other things. A big thing of mine is reducing waste & saving money without sacrificing taste or nutrition. Again thanks & keep up the good work! Fantastic! Thanks so much for these. I am a huge fan of cassoulet and look forward to giving this recipe a whirl. My wife will love this as well. Many thanks! My delightful pleasure, little makes me happier than sharing good food & good recipies. Have a great day & keep up the good work.